Islami Bank Bangladesh Limited Executive Vice President, Senior Vice President, Vice President, Senior Assistant Vice President, Assistant Vice President, First Assistant Vice President and Senior Principal Officer Job Circular 2017 has been published by http://career.islamibankbd.com/career.php on 20 September 2017.
a. Minimum qualification is Masters/Equivalent/04 years Graduation from any reputed university having sound track record in academic feat. b. Candidates having 3rd Division/Class in any examinations need not apply. Banking experience: Minimum 18 years experience as Officer in any reputed commercial bank including at least 02 years as Senior Vice President or equivalent rank. # Candidates in service are expected to apply through proper channel. # Employees of IBBL need not apply. # Candidates must not apply for more than one post. # Selected candidates shall have to execute a Surety Bond to serve the Bank for a minimum period of 03 (three) years. Selected candidates will be eligible for the bank’s regular scale of pay as admissible in the post. a. Only short listed candidates will be called for appearing at the Written Examination / Viva-Voce. b. The authority reserves the right to accept / reject any application without assigning any reason. c. All correspondences will be made through email/SMS. Eligible and interested candidates shall apply through online (career.islamibankbd.com) with scanned passport size photograph latest by October 10, 2017. Besides online application, candidates must send hard copy of application, attested photocopies of all academic certificates, professional certificates, experience certificates and two recent passport size photographs within October 25, 2017 to Human Resources Administration Division, Islami Bank Tower, 40 Dilkusha Commercial Area, Dhaka-1000 through courier or postal service duly mentioning the name of the post on the top of the envelop, failing which the online application shall be treated as cancelled. Any application delivered by hand shall not be accepted. The procedures for filling in the online application form will be available at the mentioned website. Maximum 55 years as on 30.09.2017. Islami Bank Bangladesh Limited (IBBL) authority issue short list candidate Admit card. If you selected your post you can login your User Id, Email and Password and download your admit card http://career.islamibankbd.com/career.php. 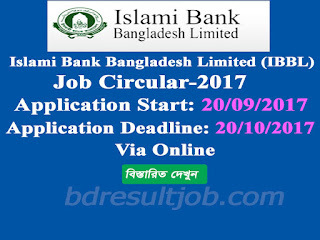 Islami Bank Bangladesh Limited (IBBL) Test admission authority will published http://career.islamibankbd.com/career.php. Every applicant can see their User Id, Email and Password. Any applicant can download and view from Islami Bank Bangladesh Limited (IBBL) official website http://career.islamibankbd.com/career.php. Every applicant can seeh their User Id, Email and Password. NB. No TA/DA will be allowed for appearing at the Written Examination / Viva-Voce. 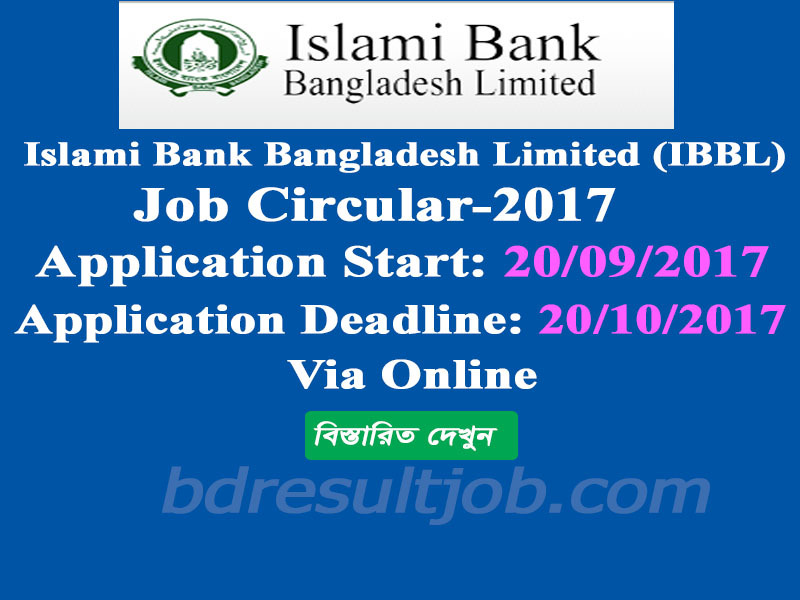 Tages: islami bank limited (IBBL) job circular 2017, islami bank limited (IBBL) Senior Vice President job circular 2017, islami bank limited (IBBL) bd jobs, islami bank limited (IBBL) recruitment 2017, www Islami Bank job bd, ibbl recruitment, ibbl jobcircular 2017 on september 2017, ibbl job, www.islamibankbd.com jobs, islami bank bangladesh limited, recent bank job circular, ibbl job circular 2017, islami bank limited (IBBL) Vice President result 2017, islami bank limited (IBBL) bangladesh limited ibbl, ibbl admit card download, islami bank limited (IBBL) Vice President job circular 2017, islami bank limited (IBBL) Senior Assistant Vice President job circular 2017, islami bank limited (IBBL) Assistant Vice President job circular 2017, islami bank limited (IBBL) First Assistant Vice President job circular 2017, islami bank limited (IBBL) Senior Principal job circular 2017, islami bank limited (IBBL) job result 2017, islami bank limited (IBBL) admit card 2017, islami bank limited (IBBL) seat plan 2017. Islami Bank Bangladesh Limited Executive Vice President, Senior Vice President, Vice President, Senior Assistant Vice President, Assistant Vice President, First Assistant Vice President and Senior Principal Officer Job Circular 2017, islami bank limited (IBBL) Senior Principal job circular 2017, islami bank limited (IBBL) job result 2017, islami bank limited (IBBL) admit card 2017, islami bank limited (IBBL) seat plan 2017.